Merging team scores from a multi-division meet is inherently risky, but it's also something of high interest value to those who raced and those with an interest in the race. 1. There is no way to "balance" the differences between the races. So were hotter, and some were cooler. Some went out faster than others. A winner of one race may have been unpushed at the end, while the winner of another race may have been pushed all the way to the finish line. And so it goes. 2. A merged score picks up runners from the B racers, if those runners figure into the top seven times for a school on the day. This is especially important to notice if a runner is serving a half-season of sub-varsity ineligibility due to the transfer rule. In this case, a merged score helps to make evident the impact this runner could have when he/she assumes full varsity status. 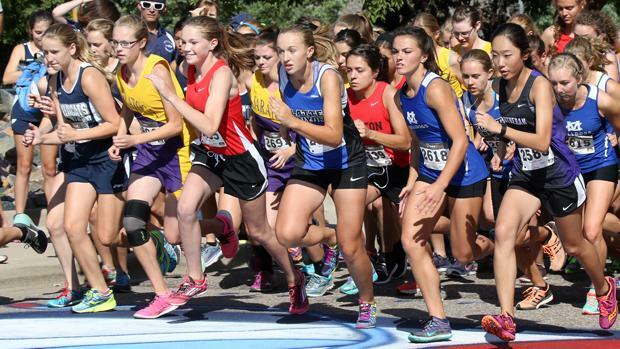 With that in view, we see below that Cherry Creek tops the team scoring in a merged race, but Broomfield settled in very close on the heels of Creek. There should be plenty in 5A girls to keep us interested all the way to the end of the season. Wheat Ridge secures top 4A honors.